This recipe satisfies the second request! If you’re looking to bring a side dish to a BBQ or potluck or even just want to make something easy to share, this casserole is it! It’s almost like a gratin, and the little chip slices are made with the Inspiralizer. You can see how to do that exactly, here. 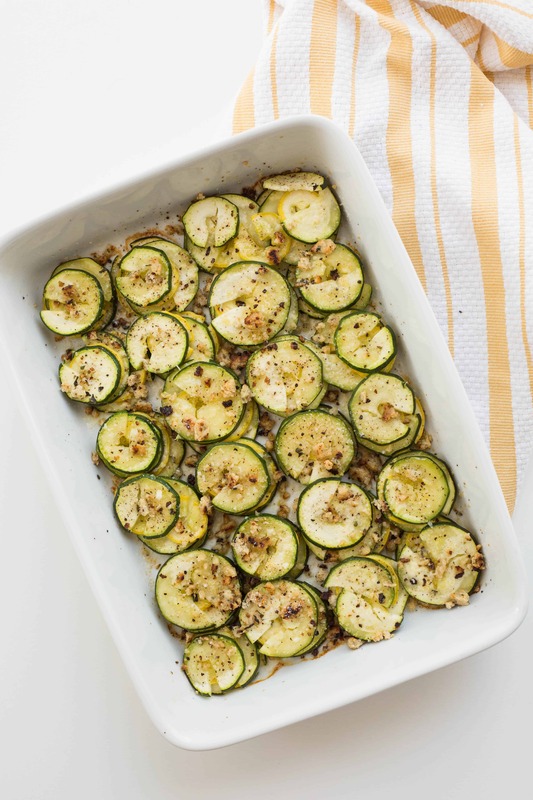 I used yellow squash and zucchini to make this gratin, to truly use up all of that summer squash! The squash cooks and softens, releasing a bit of moisture into the casserole dish, making a warm sauce once it melts with the Parmesan cheese. The gluten-free breadcrumbs are really the star of the show here. If you haven’t made them yet, let this be your inspiration. I even have a video on how to make them! They save well in the fridge, too – so you can totally make a big batch and use them all week. Now, onto other matters. It’s officially August! Starting today, I’ll be posting only three times a week, instead of four times a week. I’m decreasing the posts and preparing the next few months for my leave. I’ll be posting Sunday, Monday, and Wednesdays! You can also find new posts on inspiralizedali (I post twice a week there), if you’re looking for some more lifestyle content. Thanks for your understanding, as always! The Inspiralizer is Back in Stock! The Inspiralizer is back in stock and to celebrate, we’re having a 2-day sale! 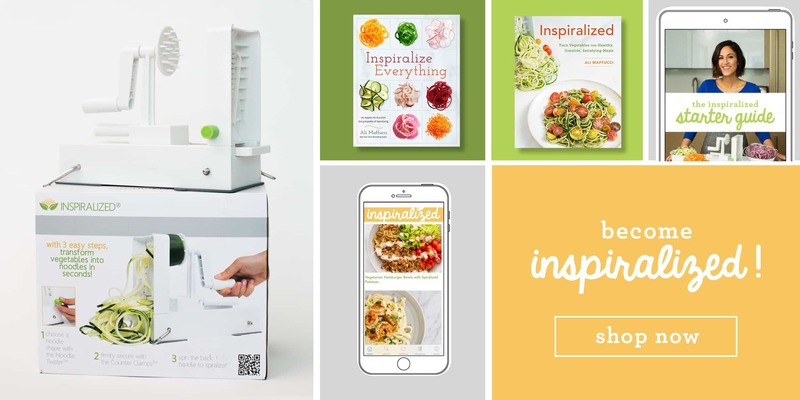 The Inspiralizer will be $34.95 (originally $49.95) for the next 2 days, until 11:59pm EST on 8/3! Place a medium skillet over medium heat and coat with cooking spray. Meanwhile, in a small bowl, combine all of the ingredients but the water for the breadcrumbs and mix together. Add in the water and use your hands to form a dough – it should end up in a ball. Crumble the dough ball into the heated skillet and continually break up with a wooden spoon. Cook for 2-3 minutes or until breadcrumbs break up, harden and become “toasted.” Set aside in a bowl. Slice the zucchinis and yellow squashes halfway through lengthwise, careful not to pierce through the center. Spiralize on Blade A to yield chip-slices. Grease a baking dish with cooking spray. Lay the zucchini in an even layer. Top with yellow squash. 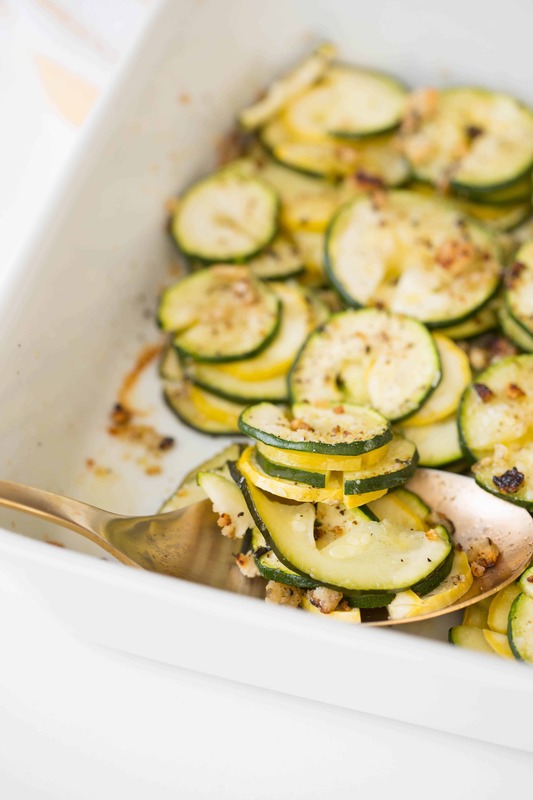 Top with zucchini. Top with yellow squash. Then, top with zucchini. Keep going until all your squash is used. Sprinkle over with the prepared breadcrumbs. Drizzle over with olive oil and season with salt and pepper. Cover the dish with foil and bake in the oven for 30 minutes. Remove the foil and immediately sprinkle with Parmesan cheese. Serve. Hi! Looks Devine! Is the recipe supposed to have Parmesan cheese in it? You say the squash melts with the Parmesan to make a sauce, but I don't see it listed anywhere else in the recipe. Thanks!!! Could I use nutritional yeast instead of the parm? Can't wait to make it! Why do not you sell inspiralized in spain? I made this for dinner tonight with a pound of Italian sausage and a tablespoon of fennel seeds. It was excellent! My whole family loved it. Will make again. 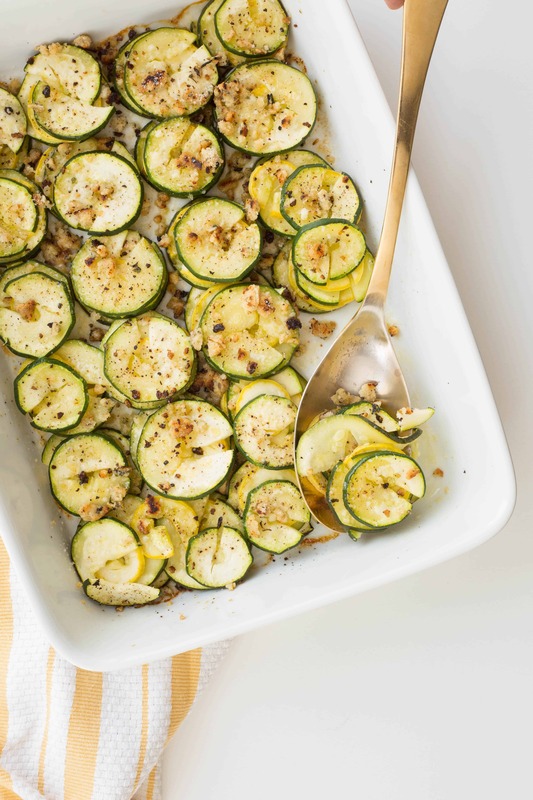 Great way to enjoy all that beautiful zucchini in our garden with a nice Italian flair! Thanks for the recipe!